After the eye-opening bus journey to Gavi, we had the second half of the day at our disposal and having been unlucky to get the wildlife safari tickets at Thekkady, we decided to visit the famed view-point of Ramakkalmeedu for the evening which is at about 30kms from Kumily. 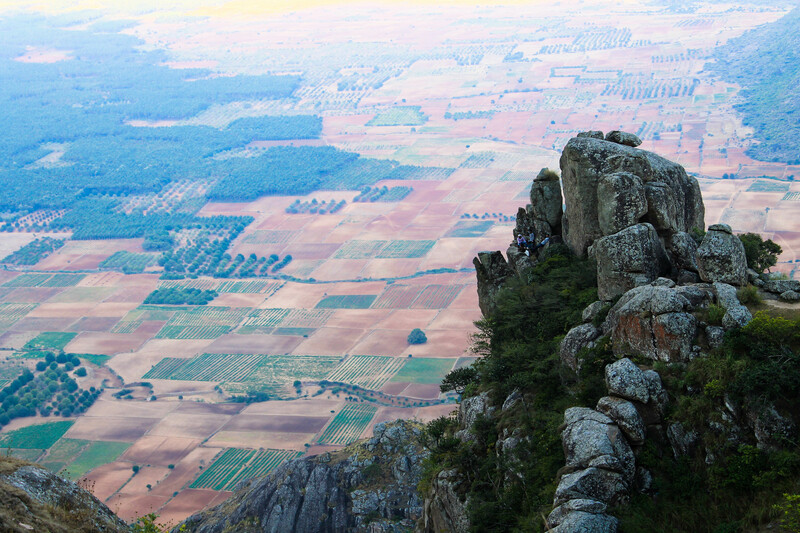 Ramakkalmeedu translates to hill that has Rama’s rock. History is that Lord Rama on his search for Sita who was abducted by Raavan, came to this place and having found the rock high above the hill, climbed over it and is said to have called out aloud for Sita. It is believed that the imprint over the hill is of Lord Rama’s foot and hence Ramakkalmeedu. Towards Munnar from Kumily, we take a diversion through a village called Kattaadi, a village famous for its wind mills among locals, and reach Ramakkalmeedu. The visiting hours is only until 5PM and the place is busy with tourists. There are two small hills opposite to each other. The higher hill has the rock that is mentioned in the stories and another one little smaller than the former has a huge statue of Kuravan and Kurathi, the tribal head and his mistress. There have been records of tribal living here since the Sangam period and the statues are erected in respect to the natives. We chose to walk up the hill that has the rock and the small walk on the slopes of this hill is an interesting one as the wind pushed you back on every step. 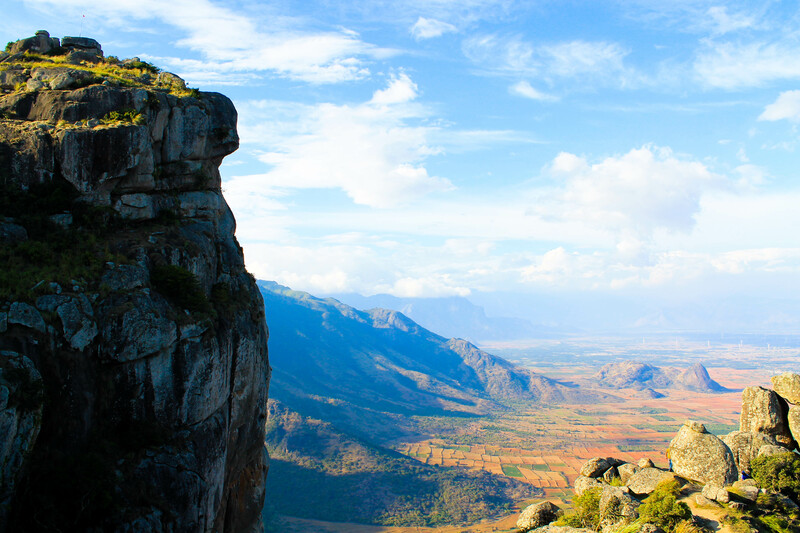 There are two major rock points, one on a lower altitude facing the plains and another is the historical one on a much higher height facing the mountain ranges on the other side. The view from this place is surely one to be cherished. 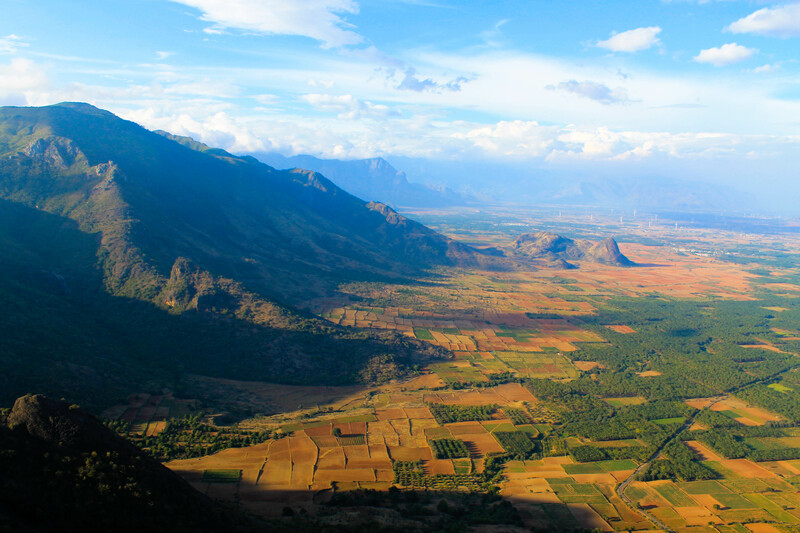 With wind trying to sweep you off, the walk around this cliff offers panoramic views of mountain ranges stretching on one side and the cities of Cumbum and Theni on another. With the Sun about to set, the entire place bore a golden color and the charm doubled. We spent time until it got really dark and got back on our way to Kumliy. Beautiful south India, with stunning photographs. Thanks for sharing. Thanks to you for dropping in, ma’m! 🙂 Thanks for yet another bouquet too! Wow! It looks like a painter has painted out his imagination….loved it! I love my India…!!! They rock! indeed! its for nothing that it is called Incredible 🙂 thanks for dropping by, Snehal 🙂 Bon Voyage!